At Primary Teaching Services we have developed a range of Home School Reading Record Books, to keep a log of pupils' reading, in full colour designs. You will find that they'll work out cheaper than making books yourself once you add together the photocopying, paper, card and labour costs. From just 40p each (ex VAT). 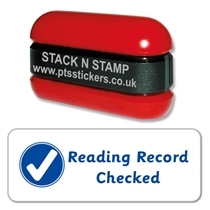 Check out Reading Reward Stickers here. Take a look at the full Record Book range.